Picture yourself diving in aquamarine water as a whale shark, the size of a school bus swim past you. 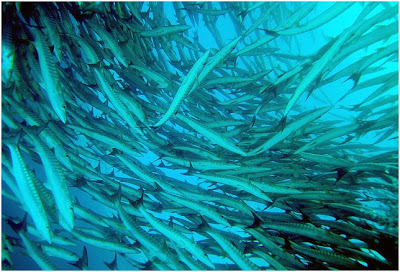 Imagine the sea darken as thousands of barracuda swirl around you. Sounds exciting? Well, if you want sun, sand and sea life, pack your scuba gear and head to Malaysia. These graceful gliders can grow to seven metres (23 feet) wide, and weigh nearly two tons. Like whale sharks, mantas are gentle and pose little threat to divers. 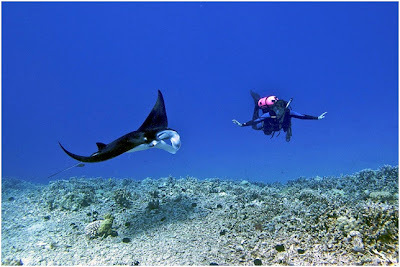 In fact, mantas are curious creatures and will sometimes approach divers. 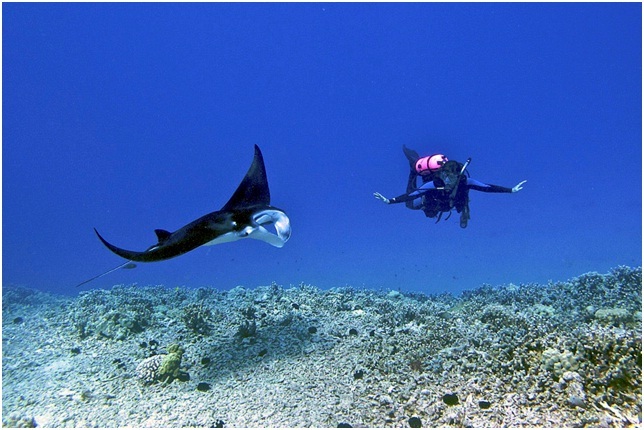 If you want a manta to approach you, try diving near Sipadan Island off the east coast of Malaysian Borneo. Manta rays aren’t shy around humans. Picture courtesy: SteveD. (Steve Dunleavy), Flickr. Fearsome-looking hammerhead sharks often ply the waters near Layang Layang Island, a deep-sea atoll about 300 kilometres (186 miles) northwest of Kota Kinabalu. 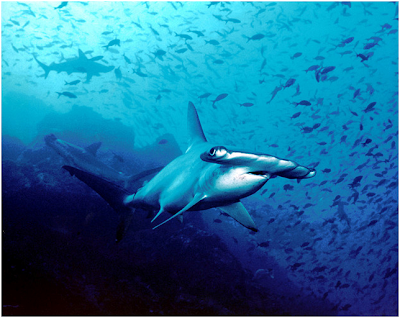 Hammerhead sharks enjoy 360-degree vision because of the location of their eyes. Picture courtesy: Petersbar (Barry Peters), Flickr. Layang Layang’s reefs host a rainbow of sea life, but the scalloped hammerheads steal the show, especially in March and May during mating season. The best place to find barracuda in Malaysia is the aptly named Barracuda Point, at the easternmost tip of Sipadan Island. The sleek, silver, sharp-toothed “tigers of the sea” frequent the shoals here. A “ barracuda tornado” can consist of thousands of barracuda. Picture courtesy: JennyHuang (Jenny), Flickr. 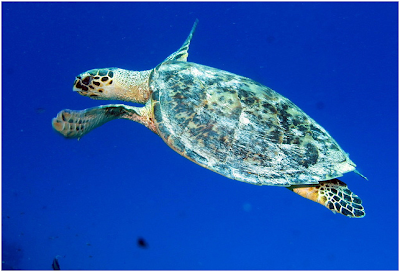 Malaysia is home to four species of sea turtles: the leatherback, green, hawksbill, and olive ridley turtles. Sipadan Island is a famous nesting site for sea turtles so don’t be shocked if you see up to 30 of them during a single dive. Not surprisingly, Sipadan’s Turtle Patch and Turtle Cavern dive sites are two of the better places to see turtles in Malaysia. You can also find them near the sandy beaches and islands of Peninsular Malaysia. Malaysia’s largest population of hawksbill sea turtles can be found in the Turtle Islands of Sabah, Malaysian Borneo. Picture courtesy: Derek Keats, Flickr. Malaysia is home to several species of dolphin, including the bottlenose, the most common type of dolphin. The Irrawaddy dolphin, on the other hand, is not so common. Although they are oceanic, Irrawaddy dolphins tend to congregate near coastal areas and rivers. Your best bet to spot these rare dolphins is near the mouth of the Santubong River on Malaysian Borneo. Dugongs are known as “sea cows” for a reason: they can eat up to 40 kilograms (88 pounds) of seagrass a day. Picture courtesy: Flickr. If you’d like to catch a glimpse of a dugong, head to the Mantanani Islands, a small group of three islands northwest of Malaysian Borneo. 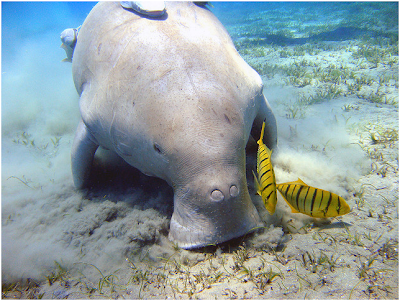 The best time to see dugongs is between October and February, but sightings are rare. If you enjoyed this article and would like to find out more about travelling to Malaysia, please visit the Tourism Malaysia website.